Greg Prudhommeaux believes in this method and has used it to manage all his on-going projects with great success. Because of this, he would like to share how he does it and help fellow entrepreneurs manage their affairs better. 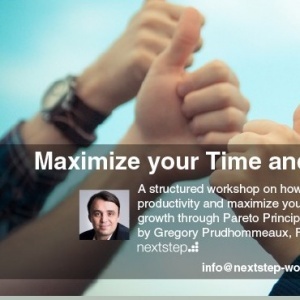 Join us on the third part of our workshop series, Maximize your Time and Resources with the 80/20 Principle where we discuss the basics of the 80/20 Principle and how you can apply it to your business and even your personal life. Learn how to set priorities, increase your productivity and take advantage of all the extra time you can get to do what matters to you the most. Learn the basics of the 80/20 principle and how you could apply it in your daily life. Identify the key result areas that you need to focus on to increase your productivity. *We have scheduled two batches for your convenience: one on November 24 (Thursday) and another on November 26 (Saturday). Please select the date you prefer on the ticket options below. If you can't attend the live workshop, leave your email here for the on-demand version, so you get notified when it will be available (no obligation).